↑ "Don't fight, adapt". National Post. December 2007. สืบค้นเมื่อ 2007-11-18. ↑ "Beyond the Ivory Tower: The Scientific Consensus on Climate Change". Science Magazine. December 2004. สืบค้นเมื่อ 2008-01-04. ↑ "Climate Change: Basic Information". United States Environmental Protection Agency. 2006-12-14. สืบค้นเมื่อ 2007-02-09. ↑ "United Nations Framework Convention on Climate Change, Article I". United Nations Framework Convention on Climate Change. สืบค้นเมื่อ 2007-01-15. ↑ Robock, Alan, and Clive Oppenheimer, Eds., 2003: Volcanism and the Earth’s Atmosphere, Geophysical Monograph 139, American Geophysical Union, Washington, DC, 360 pp. ↑ "Joint science academies' statement: The science of climate change" (ASP). Royal Society. 2001-05-17. สืบค้นเมื่อ 2007-04-01. ↑ "Rising to the climate challenge". Nature. 449 (7164): 755. 2007-10-18. สืบค้นเมื่อ 2007-11-06. ↑ "Water vapour: feedback or forcing?". RealClimate. 6 Apr 2005. สืบค้นเมื่อ 2006-05-01. ↑ "Summary for Policymakers". Climate Change 2001: The Scientific Basis. Contribution of Working Group I to the Third Assessment Report of the Intergovernmental Panel on Climate Change. Intergovernmental Panel on Climate Change. 2001-01-20. สืบค้นเมื่อ 2007-01-18. ↑ Tans, Pieter. "Trends in Atmospheric Carbon Dioxide – Mauna Loa". National Oceanic and Atmospheric Administration. สืบค้นเมื่อ 2007-04-28. ↑ "4.4.6. Resource Availability". IPCC Special Report on Emissions Scenarios. Intergovernmental Panel on Climate Change. สืบค้นเมื่อ 2007-04-28. ↑ Sample, Ian (2005-08-11). "Warming Hits 'Tipping Point'". The Guardian. สืบค้นเมื่อ 2007-01-18. ↑ "Climate Change 2001:Working Group I: The Scientific Basis (Fig. 2.12)". 2001. สืบค้นเมื่อ 2007-05-08. ↑ "WMO STATEMENT ON THE STATUS OF THE GLOBAL CLIMATE IN 2005" (PDF). World Meteorological Organization. 2005-12-15. สืบค้นเมื่อ 2007-04-13. ↑ Ruddiman, William F. (March 2005). 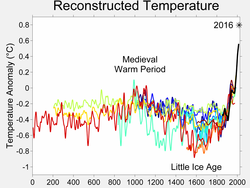 "How Did Humans First Alter Global Climate?" (PDF). Scientific American. 292 (3): 46–53. สืบค้นเมื่อ 2007-03-05. ↑ "The Open University Provides Answers on Global Warming" (PDF) (Press release). Open University. 2004-01-30. สืบค้นเมื่อ 2007-03-04. ↑ Hansen, James (2000). "Climatic Change: Understanding Global Warming". One World: The Health & Survival of the Human Species in the 21st Century. Health Press. สืบค้นเมื่อ 2007-08-18. ↑ "Summary for Policymakers". Climate Change 2001: The Scientific Basis. Contribution of Working Group I to the Third Assessment Report of the Intergovernmental Panel on Climate Change. Intergovernmental Panel on Climate Change. 2001-01-20. สืบค้นเมื่อ 2007-04-28. ↑ Macey, Jennifer (September 19, 2007). "Global warming opens up Northwest Passage". ABC News. สืบค้นเมื่อ 2007-12-11. ↑ 59.0 59.1 "Climate Change 2001: Impacts, Adaptation and Vulnerability. Contribution of Working Group II to the Third Assessment Report of the Intergovernmental Panel on Climate Change". Intergovernmental Panel on Climate Change. 2001-02-16. สืบค้นเมื่อ 2007-03-14. ↑ 61.0 61.1 "Summary for Policymakers" (PDF). Climate Change 2007: Impacts, Adaptation and Vulnerability. Working Group II Contribution to the Intergovernmental Panel on Climate Change Fourth Assessment Report. Intergovernmental Panel on Climate Change. 2007-04-13. สืบค้นเมื่อ 2007-04-28. ↑ "At-a-glance: The Stern Review". BBC. 2006-10-30. สืบค้นเมื่อ 2007-04-29. ↑ Tol and Yohe (2006) "A Review of the Stern Review" World Economics '7 (4) : 233-50. See also other critiques in World Economics '7 (4). ↑ John Quiggin. Stern and the critics on discounting. ↑ "Climate Control: a proposal for controlling global greenhouse gas emissions" (PDF). Sustento Institute. สืบค้นเมื่อ 2007-12-10. ↑ Monbiot, George. "Rigged–The climate talks are a stitch-up, as no one is talking about supply" (HTML). สืบค้นเมื่อ 2007-12-22. ↑ "Kyoto Protocol Status of Ratification" (PDF). United Nations Framework Convention on Climate Change. 2006-07-10. สืบค้นเมื่อ 2007-04-27. ↑ Climate talks face international hurdles, by Arthur Max, Associated press, 5/14/07. ↑ George W. Bush (March 13, 2001). "Text of a Letter from the President to Senators Hagel, Helms, Craig, and Roberts". Office of the Press Secretary. สืบค้นเมื่อ 2007-11-21. ↑ "Regional Greenhouse Gas Initiative". สืบค้นเมื่อ 2006-11-07. ↑ "Summary for Policymakers" (PDF). Climate Change 2007: The Physical Science Basis. Contribution of Working Group III to the Fourth Assessment Report of the Intergovernmental Panel on Climate Change. Intergovernmental Panel on Climate Change. 2007-05-04. สืบค้นเมื่อ 2007-12-09. ↑ Revkin, Andrew (2007-04-01). "Poor Nations to Bear Brunt as World Warms". The New York Times. สืบค้นเมื่อ 2007-05-02. ↑ Brahic, Catherine (2006-04-25). "China's emissions may surpass the US in 2007". New Scientist. สืบค้นเมื่อ 2007-05-02. ↑ Crampton, Thomas (2007-01-04). "More in Europe worry about climate than in U.S., poll shows". International Herald Tribune. สืบค้นเมื่อ 2007-04-14. ↑ "Summary of Findings". Little Consensus on Global Warming. Partisanship Drives Opinion. สำนักวิจัยพิว. 2006-07-12. สืบค้นเมื่อ 2007-04-14. ↑ Begley, Sharon (2007-08-13). "The Truth About Denial". Newsweek. สืบค้นเมื่อ 2007-08-13. ↑ Adams, David (2006-09-20). "Royal Society tells Exxon: stop funding climate change denial". The Guardian. สืบค้นเมื่อ 2007-08-09. ↑ "Greenpeace: Exxon still funding climate skeptics". USA TODAY. 2007-05-18. สืบค้นเมื่อ 2007-07-09. ↑ "Global Warming Resolutions at U.S. Oil Companies Bring Policy Commitments from Leaders, and Record High Votes at Laggards" (Press release). Ceres. April 28, 2004. สืบค้นเมื่อ 2007-07-27. ↑ "Group: China tops world in CO2 emissions". Associated Press. 2007-06-20. สืบค้นเมื่อ 2007-10-16. ; "Group: China surpassed US in carbon emissions in 2006: Dutch report". Reuters. 2007-06-20. สืบค้นเมื่อ 2007-10-16. ↑ China: US should take lead on climate, by Michael Casey, Associated Press, 12/7/07. ↑ India's glaciers give grim message on warming, by Somni Sengupta, 7/17/07, New York Times via oregonlive.com. ↑ Chinese object to climate draft, BBC, 5/1/07; In Battle for U.S. Carbon Caps, Eyes and Efforts Focus on China, by Steven Mufson, Washington Post, 6/6/07. Emanuel, Kerry A. (2005-08-04). "Increasing destructiveness of tropical cyclones over the past 30 years" (PDF). Nature. 436 (7051): 686–688. doi:10.1038/nature03906. Hirsch, Tim (2006-01-11). "Plants revealed as methane source". BBC. Oerlemans, J. (2005-04-29). "Extracting a Climate Signal from 169 Glacier Records" (PDF). Science. 308 (5722): 675–677. doi:10.1126/science.1107046. Oreskes, Naomi (2004-12-03). "Beyond the Ivory Tower: The Scientific Consensus on Climate Change" (PDF). Science. 306 (5702): 1686. doi:10.1126/science.1103618. Revkin, Andrew C (2005-11-05). "Rise in Gases Unmatched by a History in Ancient Ice". The New York Times. Ruddiman, William F. (2005-12-15). Earth's Climate Past and Future. New York: Princeton University Press. ISBN 0-7167-3741-8. Ruddiman, William F. (2005-08-01). Plows, Plagues, and Petroleum: How Humans Took Control of Climate. New Jersey: Princeton University Press. ISBN 0-691-12164-8. Sowers, Todd (2006-02-10). "Late Quaternary Atmospheric CH4 Isotope Record Suggests Marine Clathrates Are Stable". Science. 311 (5762): 838–840. doi:10.1126/science.1121235. หน้านี้แก้ไขล่าสุดเมื่อวันที่ 5 เมษายน 2562 เวลา 07:44 น.